You’ve seen me mention the amazing Casey Eischen and her post-mastectomy exercise program, I’m sure. I’ve done it more than a couple of times. Foobie Fitness, which started with Casey’s YouTube channel and a community page on Facebook, recently became an official non-profit! Today Casey and her team launched FoobieFitness.com aiming to help not only women navigating breast cancer-related journeys, but anyone interested in disease prevention, nutrition, yoga, and the overall cancer-free lifestyle. 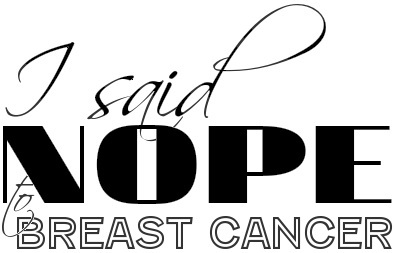 Who isn’t interested in saying NOPE to cancer?!? Make sure to visit this awesome resource! “The Coach Casey post-mastectomy exercise program is was what really helped me make a speedy and successful recovery after my prophylactic mastectomy and tissue expander reconstruction over a year ago. I knew that my range of motion and mobility were going to be severely impacted by the traumatic procedure, so I began searching for the right program that I could begin right away and would help me in my recovery. I found just that in Casey’s videos. On a side note: I had my second fill today bringing the expander to 400ccs. I have also moved my exchange surgery out a few weeks to September 11. The story continues. This entry was posted in All, Diet and tagged breast cancer, breast reconstruction, Cancer, Exercise, health, Lifestyle, Mastectomy, Nutrition, Previvor, recovery on May 30, 2014 by nope2BC.